Stain removal is one of the most difficult challenges in dry cleaning. Many stains are not removed by dry cleaning, wet cleaning or laundering alone; they require a specialized procedure calling spotting. Utilizing pressurized steam, air, vacuum, brushes, bones, ph indicators and numerous arrays of other specialized tools and spotting agents, a well trained spotter can work miracles. 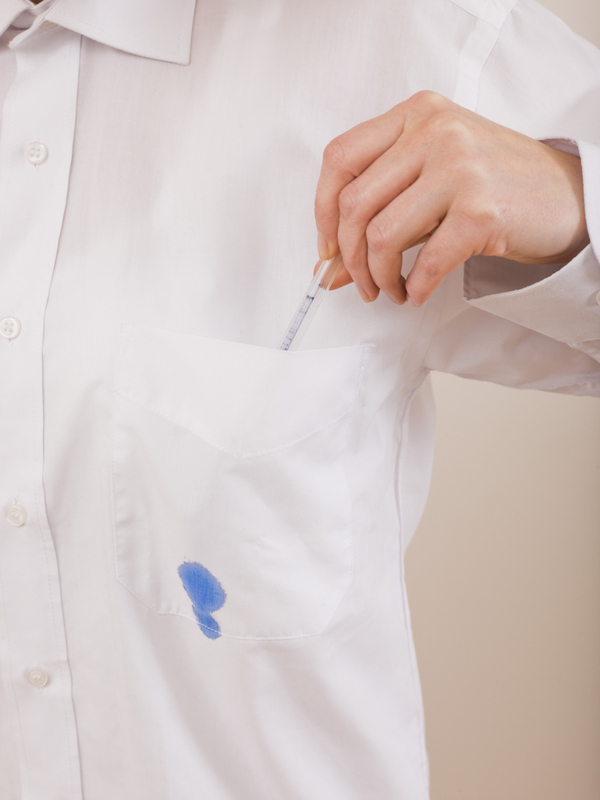 Removing a stain can take minutes, hours or even days of processing. Success Story – Recently a new customer came to Eco Cleaners with numerous garments, including his favourite shirt. We noted an ink stain on the shirt pocket but the client told us not to bother, it had been there for 2 years and his previous dry cleaner had cleaned it numerous times and deemed the stain impossible to remove. He loved the shirt and even with the stain he still had it cleaned and wore it frequently. We dry cleaned the shirt and of course the ink stain remained. Even though the client told us not to bother, even though it had been cleaned at another cleaners numerous times, we applied our extensive spotting procedures on the stain. After 35 minutes of tedious work, we got the ink stain out. We didn`t make any money from cleaning the shirt, in fact we lost money in the man hours and material costs, but what we did get is an ecstatic new client who got his favourite shirt back after years of wearing it with an ink stain. That is the level of commitment and dedication our clients have come to expect from Eco Cleaners. That is the level of commitment and dedication we demand from ourselves. Although we can’t guarantee we will get every stain out, what we do guarantee is that the most advanced and extensive techniques will be applied until the stain is removed or likely damage to the garment will occur if we proceed further. Sometimes the colour of the stain is stronger than the colour of the garment’s dye or the fabric cannot with stand more aggressive procedures. What we also can guarantee is, if we can’t get a stain out, it is simply impossible to remove and no other establishment will be able to remove it without possible damage. Success Story – Gucci had a problem, they had a one of a kind crocodile jacket with a stain and a buyer ready to purchase. They called Eco Cleaners for help. With painstaking care, utilizing our decades of experience and wealth of knowledge, we successfully removed the stain. The bill for our services – $25. The value of the jacket – $65,000. Stain removal requires knowledge of chemistry, fabric characteristics and experience to apply this knowledge. Eco Cleaners trained under the careful tutelage of the International Fabricare Institute in all aspects of stain removal, their knowledge and experience of restoring historic priceless artefacts for the Smithsonian is the same knowledge and experience we apply to your garments. For at home stain removal tips, please see our Stain Removal section in our Fabric Care Tips page.